Day 11 of “365 Things to do in Cincinnati” finds us downtown at Findlay Market. The market was buzzing with activity last Saturday. Now this guy is not for sale but WOW! can he play the violin. I chatted with him for a few minutes (his name is Darius). Not only is he a talented musician, he is one polite little man. I’m telling you this guy is going places. His parents should be very proud. All kinds of outdoor plants are sold. 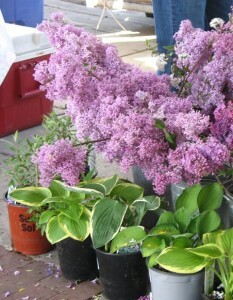 For your gardening pleasure, there are perennials, annuals, hanging baskets, cut flowers, vegetable plants and herbs. What did I leave with? Lilacs from a local farmer… and a giant peanut butter cup from Taste of Belgium (see our post on Taste of Belgium here). 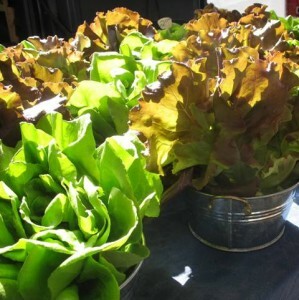 Among all the vegetables, you’ll find fresh homegrown lettuce – don’t you just love how it’s displayed?! 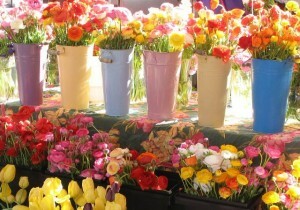 The outdoor market is open on the weekends (seasonally) and it was packed – with both shoppers and vendors. The number of vendors and the variety of goods for sale is simply amazing. Above you’ll see The Cake Rack, selling baked goods. You can get all kinds of food but you can also get homemade soaps, honey, jams, wooden utensils, handmade clothing, etc. 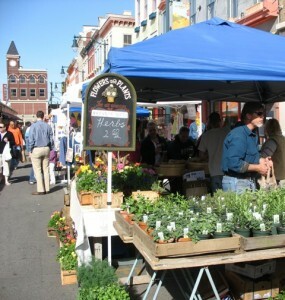 I’m telling you – if you haven’t been to Findlay Market (or haven’t been in quite a while) it’s soooo worth the trip. They have a parking lot right at the end of the outdoor covered area. And you can get everything you can possibly need to eat at this place (giant peanut butter cups included).